$13.99 & FREE Shipping on orders over $59. Prevent spillage and overflowing with this uniquely designed funnel with high backsplash. Fits carboy necks. The lower 4" inches of the funnel has like a mold release plastic stuck to it. I have tried multiple different tools and with the plastic both room temp and warm. It just breaks off into little pieces. The reason I declare this funnel useless is I'm worried about it harvesting bacteria due to the jagged, rough, and partically released plastic creating pockets. I bought one of these when I was just getting into home brewing, and I never ended up using it. UNTIL IT TOTALLY SAVED THE DAY A COUPLE WEEKS AGO! I had six gallons of wort chilled and ready to be racked into the fermentor, and out of the blue my auto-siphon broke. The one-way valve became stuck open preventing the pumping action that gets the wort moving up and over the cane. LUCKILY, I had this giant funnel (with the filter screen attached) in the basement. After sanitizing the funnel, my wife and I dumped the wort through the funnel and into the fermentor. The screen did get clogged with trub about halfway through the dump, but it was easy to rinse off, re-sanitize, and finish the job. Without this funnel as my wort transferring back-up plan, I don't know what I would have done! I wish that I had this funnel when I first started making wines from kits and also Vintner's wine bases. Pouring the juice into the fermentation container after popping off the cap or opening the juice can was an adventure (as I have spilled a lot of juice onto the floor). This big funnel gives you a margin of error so you can avoid spills. This funnel pays for itself in terms of reducing spills and clean-up time. 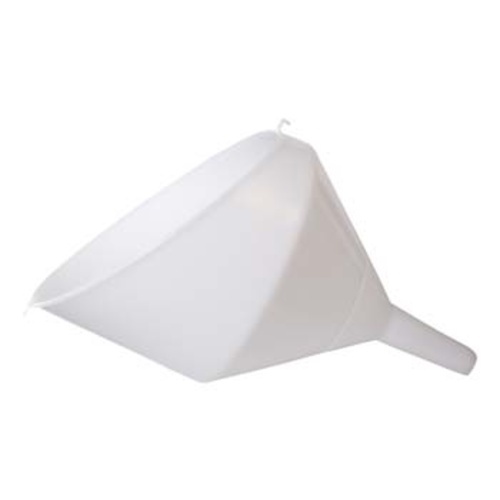 Get this funnel, you will not regret it. Awesome funnel, wish the mesh screens i ordered would snap into it. Works great as it is, hangs on the side of bucket nicely. I am going to order a second one. No more splash back - works great for liquids and grain, too. Would be AWESOME if this came with a snap in mesh filter.